The Docrafts Magazine is giving away a free Daisy & Dandelion stamp this month (Daisy in a Santa Hat) so I thought I would give it a whirl, Stamped in Momento ink and coloured in a combination of Copic and Promarkers, a couple of background papers, base card, Nestabilities, Flowersoft and ribbon were used to put the card together. 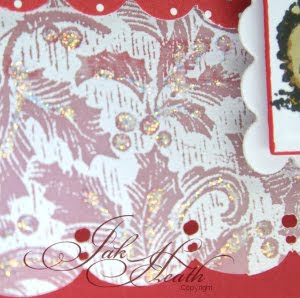 Stickles glitter glue added to the holly paper. I bought the magazine but have not done anything with the stamp yet, marvelous card which has inspired me to give the stamp a go. Thats lovely Jak like the idea of the flowersoft on the hat. Ive made one card up using this stamp as thought it was cute. Like your choice of papers..
Just received this stamp from a friend, as we don't get the magazine here. Am going to use it this weekend. Thanks Jak for the inspiration. I too have that stamp Jak and i've not done anything with it yet. Your colouring is fantastic, i love your card. Yep, I've got the stamp as well but, like the others, have done nothing with it yet. Mind you, I've had the mag a month now and haven't read that either - lol!! Great card Jak and perhaps I need to do something with the stamp - lol!! I love your card, it's beautiful, I love you papers. 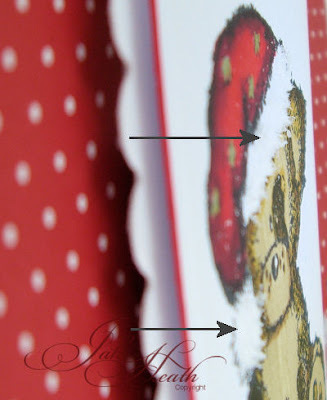 I masked my stamp and stamped another Daisy slightly overlapping and made them into one in red hat and one in green. i too bought the mag and not even touched the stamp yet... but this has inspired me! its a totally gorgeous card! love that red, its gorgeous! Such a cute stamp and what a cute card you have created with it. Love it. Great card, Jak. Like the others I, too, have the stamp but haven't taken it out of the packaging yet. Thats lovely. What a nice free gift. He(she?) is so cute. Your card is just sooooo gorgeous, Jak! Beautiful in every way!!! Pure Linen, Just like Mothers.